Al simple... libraries with "How to use" examples. These libraries are also to use in other applications. The abbreviation "...Ms" stands for UNIX Time Stamp and milliseconds (10 digits long and a 13 digits string). 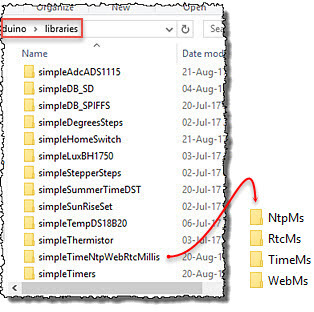 All the simpleHomeSwitch Nodes can use these simple... libraries. A Mesh Node without RTC time use the TimeMs library and sync the time, on start and interval delay, by asking another Node.